Observers of the global economy have noted that investment in infrastructure —from airports in the U.S. to power plants in Nigeria — could help boost slow and declining growth throughout the world and address challenges in both advanced and emerging economies by raising productivity, prospective returns on a variety of capital investments, and expectations about the future. But while the estimated requirement for global infrastructure investment is about $4 trillion annually, less than $3 trillion is actually taking place. New ideas to transform this gap from a challenge into an opportunity to create value for the global economy and society more generally are the focus of this book, involving several key members of the faculty of the Stern School of Business at New York University. Authors include Pankaj Ghemawat, Joel Hasbrouck, Peter Henry, Michael Posner, Paul Romer, Michael Spence, Paul Tice, Stijn Van Nieuwerburgh, Ingo Walter, Tensie Whelan, Lawrence White and David Yermack. The focus is to better harness large pools of institutional capital such as pension funds to infrastructure projects through the global capital markets. A key issue here is that the main source of infrastructure finance (state and localities and special districts created by them) are budget-constrained (in particular by public employee pension obligations) and local borrowing capacity, while the Federal role has historically been fairly limited (except for the Eisenhower interstate highway system in the 1950s). This role Trump wants to greatly expand, but using “private capital.” Where is this going to come from and who is going to bear the risk? Trump may be exaggerating the appetite of investors in very long-term infrastructure debt and the inevitable political exposure (e.g., limits on prices that infrastructure projects can charge) without some form of Federal guarantees. So Trump’s ideas so far are fuzzy, and we’ll have to wait and see…. 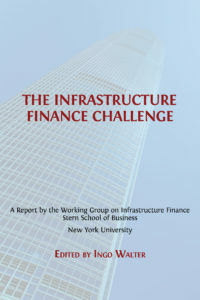 The Infrastructure Finance Challenge can be read for free here. Ingo Walter holds the Seymour Milstein Chair in Finance, Corporate Governance and Ethics Emeritus at the Stern School of Business, New York University.